RTC’s Brad Jenkins (@bradjenk) is providing on-site coverage of the ACC Tournament all week long. This game lived up to the hype. This was perhaps the most anticipated semifinal matchup in ACC Tournament history and the two teams delivered an instant classic. It was only fitting that the outcome wasn’t decided until the game’s final possession when North Carolina missed two shots in the last three seconds. For most of the first half it looked like a mismatch — North Carolina raced out to a commanding 13-point lead and the Blue Devils were dealing with foul trouble to their depleted front line (especially true with Marquise Bolden out). But Mike Krzyzewski got some surprising production from his bench and Duke roared back to tie the game at the half. After the break Duke took the lead and looked to be in control only to see the Tar Heels rally. It wasn’t the prettiest game — the teams combined to make just 9-of-47 shots from deep — but the intensity level and effort from both teams was top-notch. And who knows? We may get to see them go at it again in Minneapolis. Duke’s bench came through in surprising fashion. Zion Williamson was outstanding, but Duke would not have pulled this game out without the play of the much-maligned Blue Devils’ bench. Led by Cameron Johnson (16 first half points), North Carolina was rolling in the first half and beating the Blue Devils down the court for transition buckets. Additionally, Cam Reddish and Javin DeLaurier were in foul trouble. First, Krzyzewski inserted Jordan Goldwire into the game in place of Reddish and his defense helped turn the game around. Goldwire took on the assignment of slowing down Coby White, an absolute jet in the open court, while starting point guard Tre Jones moved over to harass Johnson. When DeLaurier picked up his third foul, seldom used Antonio Vrankovic got the call and held his own with the Tar Heels’ frontcourt for a total of 10 minutes. Goldwire earned postgame praise from both head coaches for the energy he brought to his team when they needed a boost. History repeats itself (barely). This makes the third year in a row that these two old rivals have met in the ACC Tournament semifinals. In each of those prior tourney matchups, the winner was the team that had lost the prior meeting between the two a week earlier. In fact, that has been the case in the last five ACC Tournament meetings between Duke and North Carolina (2003, 2011, 2017-19). For North Carolina, this tradition runs even deeper — over the last 46 years, whenever the Tar Heels face Duke in the ACC Tournament after defeating the Blue Devils in the regular season finale, their record in those games is 0-6. But recent rivalry history is not all bad news for Williams. During his 15 years at the helm in Chapel Hill, the winner of the last regular season Duke-UNC matchup of the year has gone on to perform better in the NCAA Tournament than its rival 13 times. Player of the Game. Zion Williamson, Duke. The freshman phenom finally got his chance to play in college basketball’s biggest rivalry and he made the most of it. Williamson finished with 31 points and 11 rebounds and ended up making the game-winner when he followed up his own miss with 31 seconds to go. “The guy that’s been hurt [Zion Williamson] came back and put on his superman jersey again and was incredible. It’s such a blend of strength and power and quickness that we couldn’t stop him getting the basketball inside and going to the basket.” – North Carolina coach Roy Williams’ opening comments in the press conference. “This was obviously a great game. I mean vintage ACC, Duke-North Carolina.” – Duke coach Mike Krzyzewski on the game. “I mean it was tough watching the first two games. 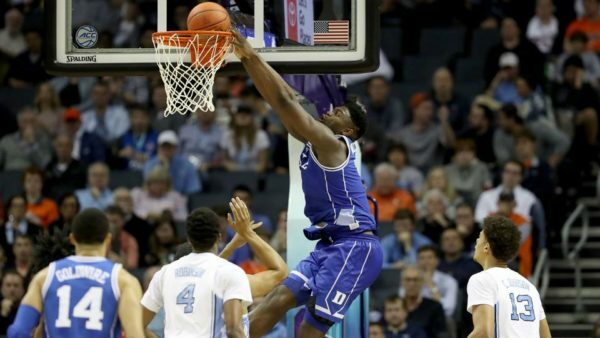 […] the rivalry lived up to what I expected it to be” – Duke’s Zion Williamson on finally getting to play against North Carolina. Sights and Sounds. This was probably the most anticipated semifinal matchup in ACC Tournament history, so it was fitting that this battle between Tobacco Road rivals took place in the state of North Carolina. As expected, the Tar Heels had the support of about two-thirds of the Spectrum Center, but both sets of fans were extremely into the game throughout the contest. What’s Next. Duke moves on to play Florida State for the ACC championship on Saturday night. It will be the second title meeting between the two schools — the Blue Devils beat the Seminoles in 2009. Duke and Florida State only played once in the regular season, with Duke winning a one-point buzzer-beating game in Tallahassee in early January. Burning Question: Can Grayson Allen become the senior leader a young Duke team needs? With a starting lineup full of potential NBA first-rounders, Duke is receiving a lot of love in national preseason rankings — #1 in the AP and USA Today polls, #2 in the RTC16. But four of those projected stars are freshmen, and Mike Krzyzewski only returns one player of significance from last year’s ACC Tournament championship team. Of course, that player just happens to be the most polarizing figure in college basketball — senior guard Grayson Allen. Just three short years ago, Duke entered the 2014-15 season with a very similar roster makeup and eventually rode freshman stars Jahlil Okafor, Justise Winslow and Tyus Jones all the way to an NCAA title. The unheralded but equally important component of that team’s success was the leadership of its lone senior, Quinn Cook. For the Blue Devils to meet their lofty goals this season, Allen will need to channel Cook’s leadership to guide his young teammates in a similar fashion — essentially by having a productive season on the floor and avoiding any further dirty-play incidents. 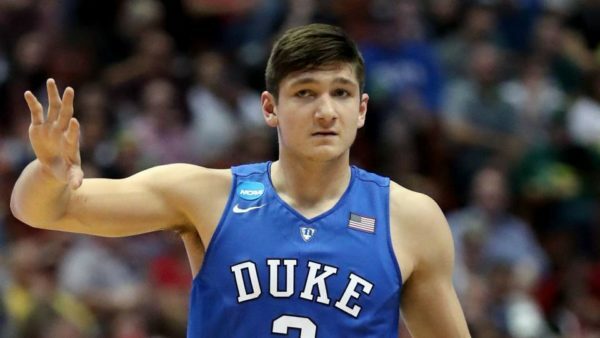 As the lone senior for Duke, Grayson Allen must provide positive leadership to the talented youngsters on the team, which means he must avoid any more episodes of dirty-play.